DID YOU KNOW YOUR DOG’S NUTRITIONAL NEEDS CHANGE OVER TIME? When you’re shopping for pet food, you no doubt notice how many different formulations are available — and they’re not just divided by flavours; they’re also segmented according to life stage. Puppy, adult, and senior formulas are all designed to address your dog’s specific needs during each life stage. Since their bodies are growing and changing every day, puppies require a higher nutrient content in their food than do adult or senior dogs. Their activity level is greater than adult and senior dogs as well, which means they require more calories. Once a puppy is weaned, it’s important to feed a high-quality food specifically for puppies to make sure your dog grows up as healthy and strong as possible. You’ll need to feed your puppy often; three times a day (up until 6 months of age) is ideal, and then twice daily once your dog reaches 6 months. In the middle of their lives, dogs still require a formula specifically tailored to their life stage. If adult dogs eat puppy food, they risk ingesting too many calories and gaining extra weight; if they eat senior food, they might not get enough calories. It’s important for adult dogs to eat a formula with the right blend of nutrients. 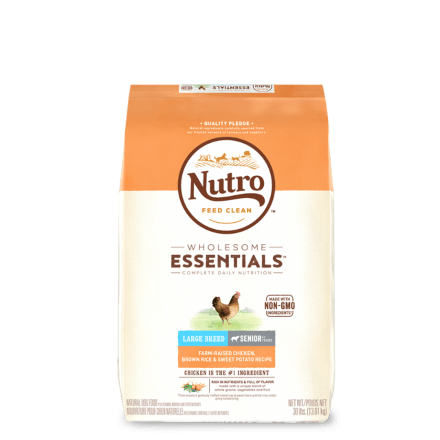 NUTRO™ Dog Food comes in a wide variety of formulas, with a number of options available to address any specific health needs your dog might have (such as weight management, food sensitivities, skin and stomach issues and more). As they age, dogs’ activity levels decrease, and their nutrient requirements change; for instance, they require more fibre to ensure their digestive tract maintains proper functionality and health. Senior dog food contains fewer calories and still has the appropriate balance of nutrients for senior dogs’ life stage. At what age does your dog become a senior? It depends. Smaller dogs tend to live longer, so they become seniors later than large-breed dogs. In general, a dog is considered senior once reaching half or two-thirds of his breed’s average lifespan. Carrying and nursing puppies can be a huge drain on a mother dog’s physical resources; she will require much more from her diet. Pregnant and nursing dogs can be fed a puppy formulation to ensure all their nutritional needs during this specific time are met. Consult the food’s packaging to determine how much to feed. Regardless of your dog’s life stage, it’s important to feed a high-quality, natural food with the proper balance of fats, carbohydrates, proteins, and vitamins and minerals. 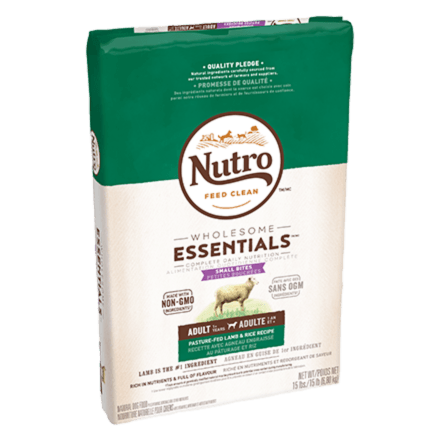 NUTRO™ Dog Food can meet your dog’s nutritional needs at every life stage and can address many specific health needs. Take a look at our product lineup and use the filter on the left side of the page to find exactly the right formula for your dog. When you give your dog treats, it’s just as important to look for natural ingredients as it is when you shop for your dog’s food. The NUTRO™ Company believes that natural foods are safer, healthier and tastier, and this applies to biscuits and treats as well. COULD YOUR DOG HAVE A FOOD SENSITIVITY?